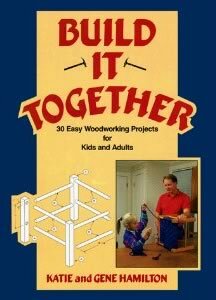 This wooden crane project has quite a few parts, but makes a very cool toy for kids and has a few challenges for young woodworkers, but nothing that can not be done a little at a time. 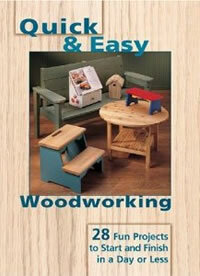 This project is easy and combines a bit of simple woodworking with drawing or painting. The only bit I can add to making these concentration tiles would be to draw tools on them as the subjects. 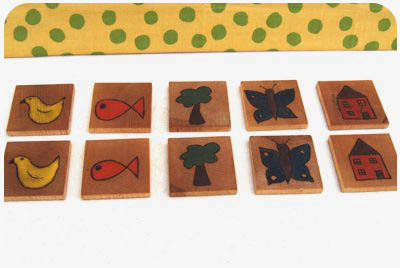 Tip: If you use cedar, then the tiles can be used as coasters when your child outgrows the concentration game. This nice little project is fun because the boomerangs are easy to make and when you are done, you can get the kids outside and running around. These great videos cover all the aspects of building them. And don’t worry, even though the video shows a bandsaw and electric sander, you can do this just as fast with handtools so the kids can do everything. 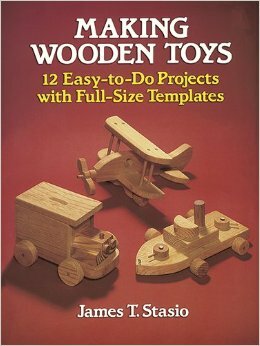 Boy Mechanic Vol 1&2 are a great collection of homemade toys and tools from the early 20th century. 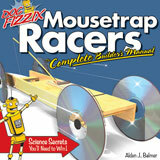 There is a wealth of fun things to be made with kids. 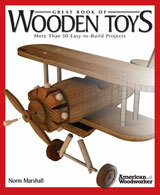 The Great Book of Wooden Toys is full of over 50 projects for building wooden toys like planes and cars and trucks.